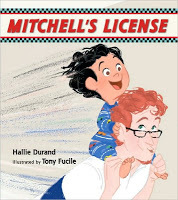 When Mitchell’s License showed up, I thought it was going to be the cheesiest thing ever (I have low tolerance for cheesy picture books). I was, happily, wrong. This one has earned a place on our permanent bookshelf. I even came in to see Bart reading it on the couch by himself, after Ella had lost interest a few pages in and run off to play in her room. Mitchell suffers a common childhood problem – he desperately does not want to go to bed. Finally, his dad says that he’ll be a car and Mitchell can drive the car to bed. Mitchell thinks this is a fantastic plan and soon he’s the one pushing for bedtime, zooming up and down the hallways, changing the oil in his dad’s car (forcing an enormous glass of water down his dad’s throat), and learning to back up when necessary. Of course, when Mitchell decides that the car needs gas (in the form of cookies – you can guess that the gas tank will be located on Mitchell’s face, not his dad’s), then the car takes on a mind of it’s own. It’s all very cute and funny, and just the kind of thing a little boy (or girl!) will love. It’s not particularly text-heavy, which is nice, and the illustrations are a perfect match. I may be especially partial to it because the driving-a-car-to-bed thing seems like something my own dad would have done. I loved reading this book on your couch too! This looks precious! I must add it to my "buy for the nieces/nephew" list! When I read this review, I ran right to the computer to reserve this book. It arrived in late August, and we have read it over and over… when a book makes your seven year old laugh out loud, you know it's a keeper!